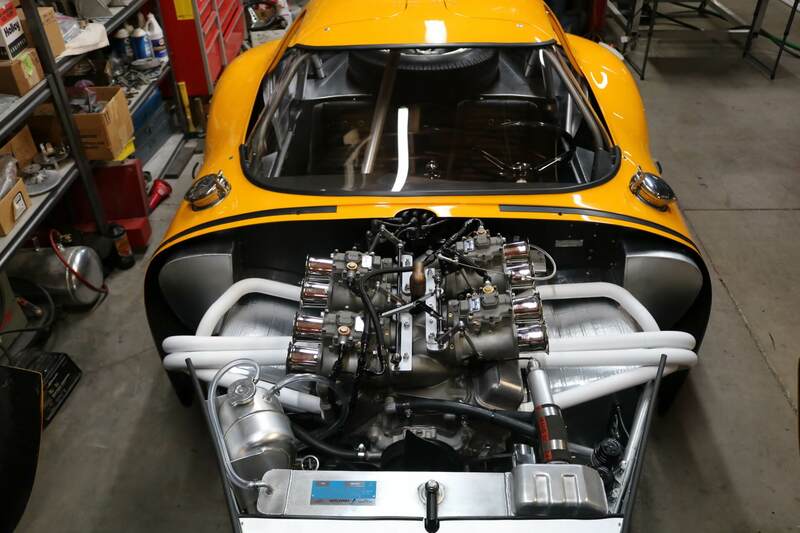 Yes the 1964 Bill Thomas Cheetah owned by Sam Goins is going to auction, Built in Jan 1964. This Cheetah is a Genuine Bill Thomas Cheetah that has been repainted Red from its original Dark Blue Color when purchased from Bill Thomas Race Cars. The very RARE Bill Thomas Chevrolet R&D drive line was removed and replaced with over the counter parts. The original drive line is what made the Daytona Cheetahs so fast. Missing is the Special built R&D 1963 Corvette 327/377 470HP dual air meter Thomas engine plus special Roller 1st gear Muncie 4 speed transmission with an incredible 2.92 R&D Gear set. Also missing is the very rare original Pontiac NASCAR radiator and the R&D Z-06 Oil Cooler. This in fact was the reason for this car to run up over 200 MPH. It's to bad Original means all original even Paint and drive line must be original to call it all original. It is my best Opinion this Cheetah must be restored back to its delivered status Feb 1964. It must be repainted Dark Blue and the Drive line must be correct as delivered by Bill Thomas Race Cars. I agree if it were 100% original I would preserve it, But It Is (NOT). There are all original Cheetahs still in Collections that are 100% original and I would agree not to restore these cars. We had to remove #005 Genuine History from our official Bill Thomas ID number Cheetah partial list of cars. Due to ID number switched to #004, But fact is Bill Thomas records show #004 is in fact the Ralf Salyer Cheetah ID number, Also a big problem for using number #004 is that Yeakel tried to auction his Cheetah as #004 over the auction block at Pebble Beach. I have video of the (NO SALE) Odd thing is Yeakel has Documentation as BTC 003 and fake ID number stamped in chassis as BTC 003 but auction house calls it #004 over the block Per Yeakel request. So now the Sam Goins car has claimed #004 as its ID number, after Yeakel claims his car is #004. So we can't have Three (3) (#004) Cheetahs can we. The Genuine #004 is the Ralf Salyers Cheetah period. This is a nice example to restore to its delivery Color & options as produced new and sold on day one. Old Racers BS and Folkloer need not aply to this Cheetahs History. Just Bill Thomas Facts when sold new Jan 1964. I understand today very well what Bill Thomas Jr told me about his son Bill III I laughed the first time Bill Thomas Jr said there is one fact you will learn when tommy (Bill III) lips are moving he is Lying. He should not have anything to do with any of my Cheetahs everything he touches turns Toxic. This is why I have all of the Bill Thomas files today and Bill III has (0) ZERO. What he is thinking to try and document Cheetahs incorrectly with wrong ID numbers he has (NO) Business trying to rewrite False Cheetah History. He joins the Rank & File of Fake Cheetah News Fred, Now we have Fake Cheetah News Tommy (Bill III). I fully understand what Bill Jr meant when he called Tommy (Bill III) a Damn Dummy. There is clear evidence in everything Cheetah related Tommy does he is 100% Delusional. There was No Love loss between father and son. Bill Thomas Jr. Never wished Tommy (Bill III) to have any authority in his Cheetah Legacy. Bill knew his son Bill III would only DESTROY it. Bill Thomas Cheetah 1964 What was the last Cheetah to leave Bill Thomas Shop? The last 1964 Model Cheetah to leave Bill Thomas shop was the Riverside Red 327 375HP PSA Airlines Cheetah in Dec 1966 It was totaled in the fire of Sept 1965 and remanufactured at Bill Thomas Race Cars. It was given a 2nd ID# in Bill's file of production builds. The car was restored with its Historical 1st ID# 013. 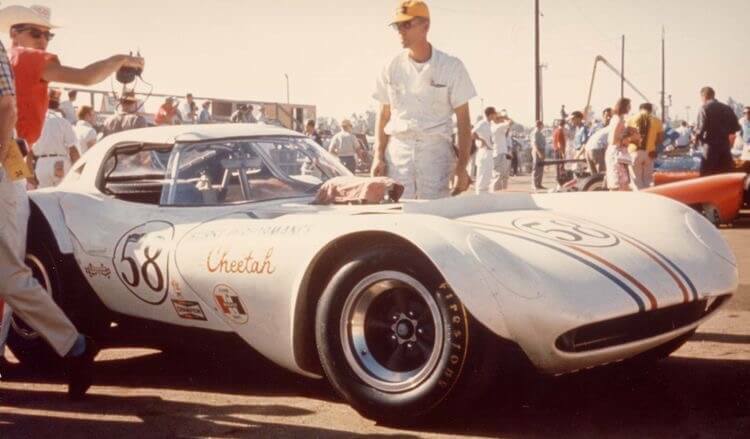 The very interesting fact in Cheetah history is that the Experimental Aluminum 1965 427 Le Mans Super Cheetah was the absolute last Cheetah to leave Bill Thomas Race Cars. It was sold in 1970 at the Sheriffs Auction after Bill Thomas filed for Bankrupcy on all his Companies. Bill would end his Automotive career at this time for good. He also ended his 13 year affiliation with Chevrolet. 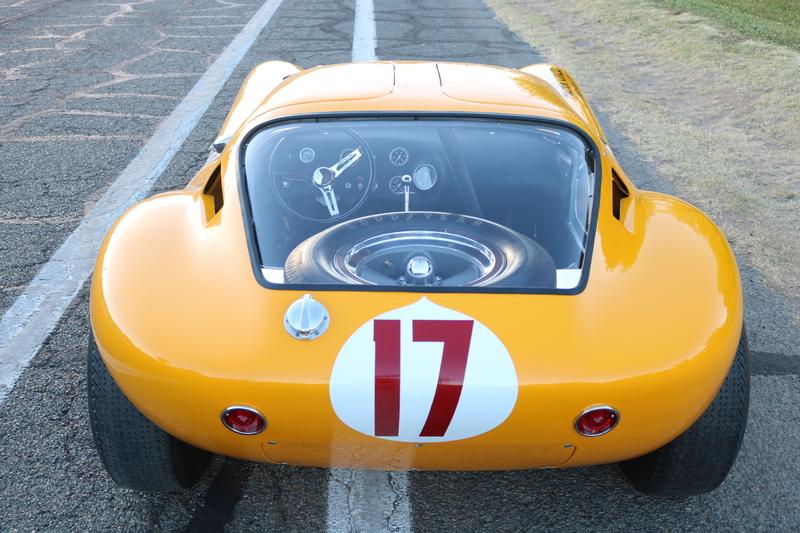 It started when Chevrolet noticed Bill Thomas prepared Corvettes winning all over Southern California SCCA events in 1956 and 57, Bill was given the 1st 1957 Venetian Red Fuel Injected RPO 684 Corvette to be delivered to the West Coast. Bill would prepare this Special Corvette and start winning races with it, Infact Bill Thomas sold it to Bob Bondurant and was very successful with it starting his racing career with Corvettes. It all ended with the last car given to Bill Thomas to prepare from C/E/C was the 1st production 1970 model Camaro he would prepare for Trans Am racing. Bill Thomas Cheetah 1964 When will the Certified Genuine #003 Alan Green Daytona car be completed ? 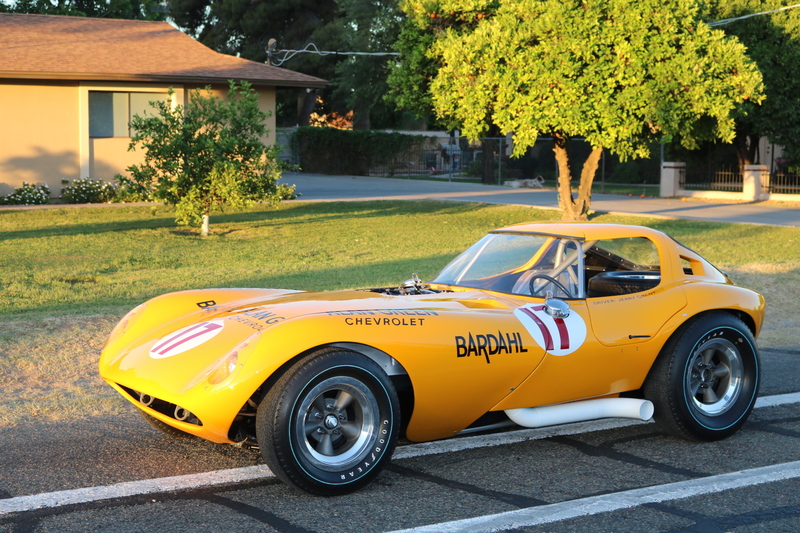 1964 #16464003 Bill Thomas Cheetah ordered by the famous Chevrolet high perforamce dealer in Seattle Washington Alan Green Chevrolet it was the 1st production car ordered, Also it was the 1st Full Race Competition Cheetah sponsored by Bardahl. 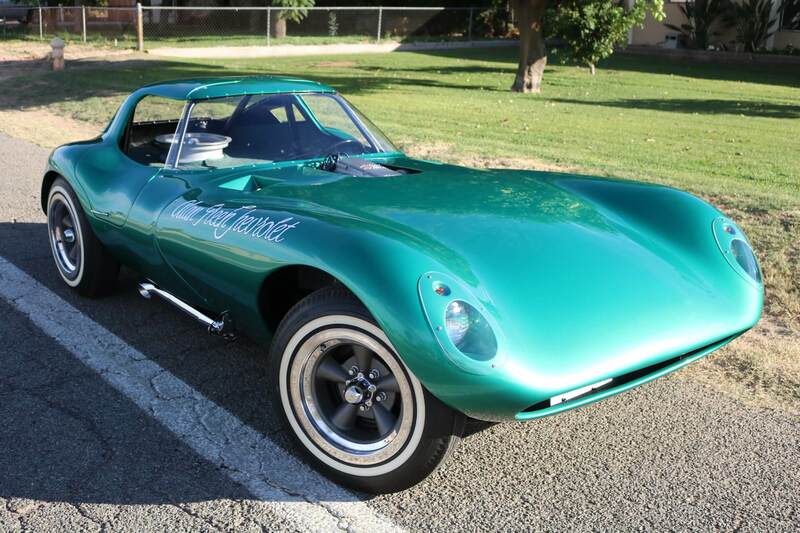 The official BTM of Arizona has completed the restoration and has certified Genuine #003 Bill Thomas Daytona Cheetah. The almost all original interior is incredible. Also the very rare today Magnesuim American Racing Wheels with original GoodYear Blues Streak Stock Car Special tires. The EXP #19 C/E/C aluminum engine is an incredible piece of Chevrolet History,it is stamped 1963 USAC as used in an INDY car in 1963. 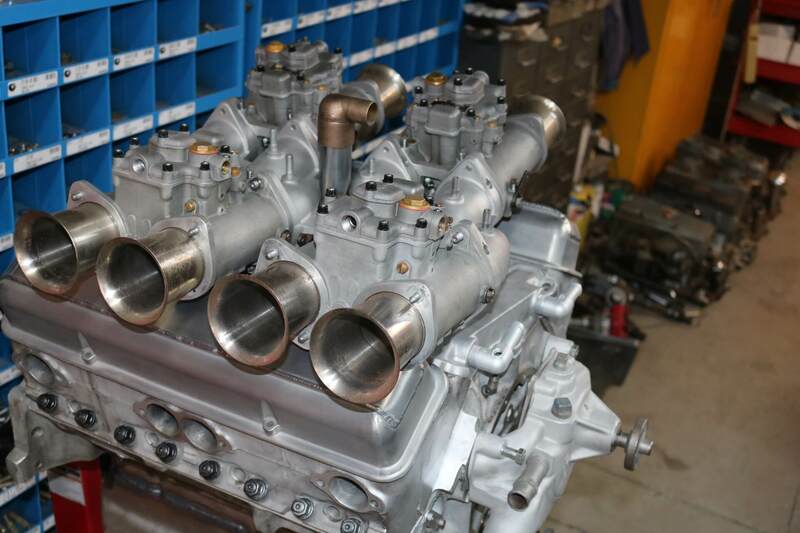 This engine was also sent to Traco to get built and Dyno tested. It is so exotic with the 58mm DCO4 carbs. Engle roller cam is a Traco grind. What a most spectacular Racing example of Bill's lite weight sports racer with Chevrolet backing and Prototype racing parts. This Very Rare Cheetah It was completed on May 10th 2018 stay tuned for the pictures after I pick it up from getting hand painted lettering. WOW, It will be stunning. the 4th Genuine Bill Thomas Cheetah to get full restoration here at BTM of Arizona. 2018 is going to be another trend setting year for BTM. It's truly an Honor to be restoring so many Genuine Bill Thomas Cheetahs and Certifying them with correct Historical ID numbers. The Real Bill Thomas Jr. is watching over us. Bill Thomas Cheetah How many Cheetahs did Bill Thomas Build? 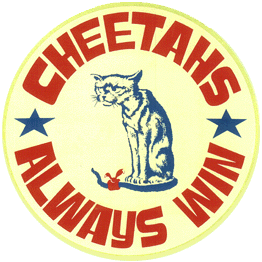 How many Cheetahs did Bill Thomas Company build? Bill's Serial ID numbers produced were #001 through #029. We dont have this many individual Cheetahs built due to damaged and totaled Cheetahs that were remanufactured at Bill Thomas Company.When a Cheetah was totaled it lost its 1st ID number and a 2nd ID with the new build/Remanufacture was entered in the build file. We have as many as 11 remanufactured Cheetahs. leaving us with a Vehicle total of 18 Cheetahs. This is what Bill really did not want to talk about for years. But today we know this was normal practice among low production car manufactures. I had the pleasure of spending many years talking with Bill Thomas From June 1994 through Oct 2009. Even when Bill was in the Hospital toward the end he would have his wife call me and ask to drive over Bill wanted to talk. So yes I drove many times over to the hospital care center to have time with Bill. It was about 5 hours from door to door. As you readers can tell Bill Thomas was one of my Hero's. It is rare to get so much time with great minds. We sure do miss him. We were very good friends. Bill Thomas Cheetah 1964 #008 Car. Is the Famous Jerry Titus car the #001 or #002 Prototype? First I must say the #001 Cheetah was wrecked twice at Riverside Raceway Oct 63 & Feb 64. The remains were used to start the 1965 Prototype Super Cheetah project. The front bonnet, cowl, header and dog legs. Plus the main roll hoop was used. So it would be False the Titus car could not be #001. The Dec 30th 2017 Barn Find #002 prototype Cheetah out of Oklahoma has its Genuine Bill Thomas Race Cars Serial ID Tag in place. Documenting it as the Genuine #126364002 Aluminum prototype car. BTM Bill Thomas Motors has certified it as the Genuine #126364002 Aluminum Cheetah. The ID#008 Riverside Red Titus car Racing #16 & #36 and the #002 Racing in Riverside Red #58 and White #58 car have 2 seperate histories, Fact check the Riverside Race Oct 1964 both these Cheetahs were at the same race. Entry White Bill Thomas personal car #58 was the #002 prototype, Entry Red Bill Thomas Race Cars team car #36 was the #008 Titus car. Conclusion Internet fake news that the Titus Race Car is #001 Aluminum prototype or now #002 aluminum prototype is 100% FALSE INFORMATION. The Jerry Titus #16 #36 Elvis Spin out Movie Cheetah is still missing. Stay tuned I have a new lead on the whereabouts. Exciting Cheetah History Facts. Bill Thomas Cheetah 1964 #013 PSA airlines car restoration finished ? Yes the 1964 Bill Thomas Cheetah #013 PSA Airlines Cheetah was finished Sept 22nd 2017 by BTM Bill Thomas Motors of Arizona. The owner in Ohio had purchased it from Bill Thomas in Dec/Jan 1967 for $3440 and has owned it for 51 years now. The car is just stunning to see in person. Bill Thomas sure picked the right man to build and restore his Cheetahs. We are very proud of this Honor taking place in Cheetah History. What a thrill to walk out in the shop every day. This Genuine Cheetah has been Certified with a BTM Bill Thomas Motors Certificate of Authenticity. Bill Thomas Cheetah 1964 Barn Find #002 aluminum prototype Found setting in a barn for 49 years? Yes its true Robert Auxier owner of BTM Bill Thomas Motors of Arizona made the deal to purchase and remove it from the Barn it was stored in and have started the complete restoration here at BTM. The Rarest most incredible most valuable Holy Grail find 1964 Genuine Bill Thomas Cheetah Aluminum prototype ID#126364002 original tag is still on this Cheetah. 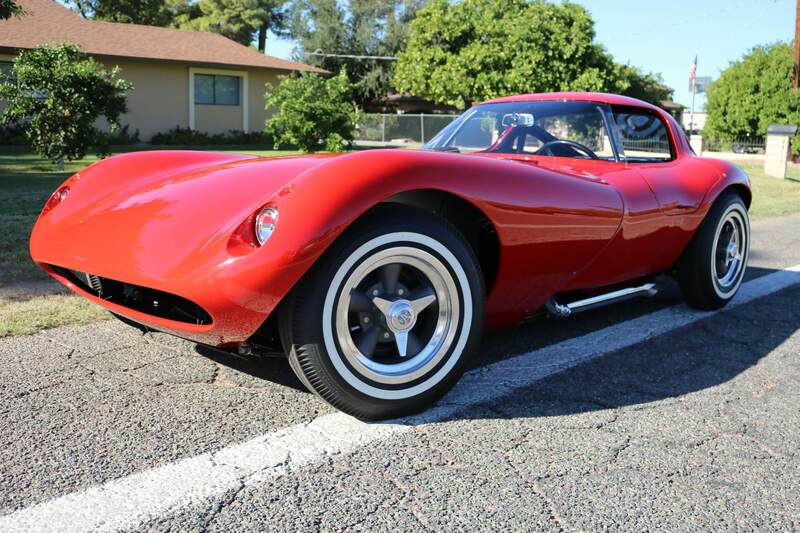 This Cheetah is the 2nd built of (2) Special lite weight aluminum body prototypes. I have known of this Cheetah for 24 years and the only person I disscussed it with was Bill Thomas himself. This is the greatest Cheetah find in history. We are going to restore it back to its April 1964 Riverside Red stock apperence with race #58.As driven by Jerry Titus at Riverside Raceway. Chevrolet tested this Cheetah in (Secret) and a report was written on the testing. This was Bill's Personal promotional car and Sports Race Car. Stay tuned for fantastic updates on the restoration progress. This Genuine Bill Thomas Cheetah has been certified by BTM Bill Thomas Motors of Arizona with a Certificate of Authenticity. Bill Thomas Cheetah 1964 #006 known as the Silver #33 Clarence Dixon Cadillac Car SOLD? Yes its true a big collector of sports cars & race cars bought the 1964 Clarence Dixon Cadillac Cheetah #006, It bid up to $850K at Barrett Jackson Auction in Jan 2017 and was a No Sale. Car was sold for 7 figures. 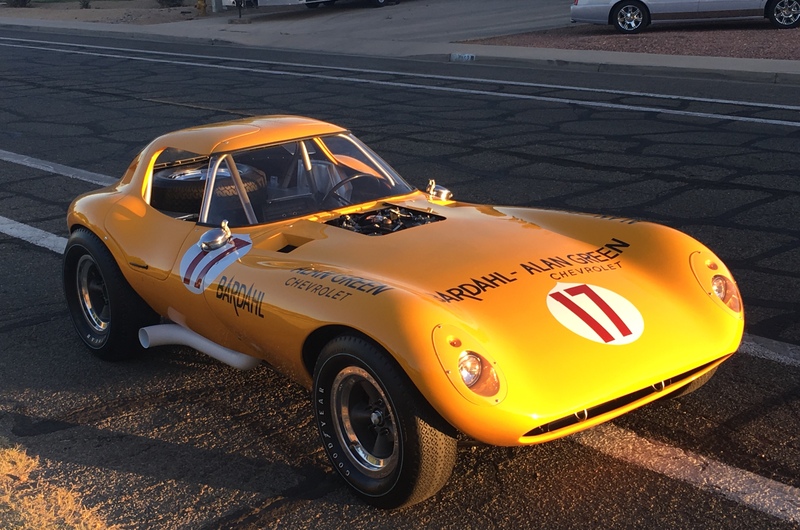 This Spectacular Racing Example was restored by BTM Bill Thomas Motors of Arizona. This Genuine Bill Thomas Cheetah has been certified by BTM Bill Thomas Motors of Arizona with a Certificate of Aurhenticity. Bill Thomas Cheetah 1964 #007 Alan Green Chevrolet Street Car SOLD? 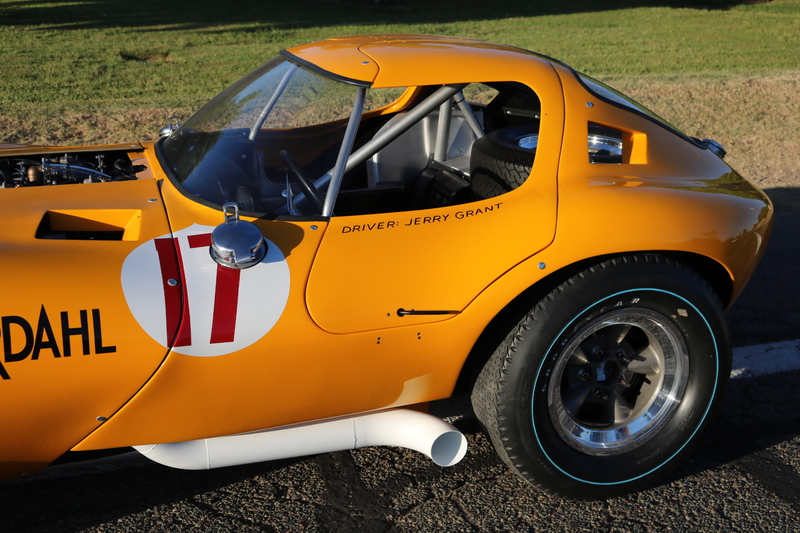 The 1964 Bill Thomas Cheetah #007 Alan Green Street Car SOLD at Russo & Steele Auction in Scottsdale Arizona Jan 2018. Selling Price was $600K plus $60K in Fee's For a total of $660,000. Restored by BTM Bill Thomas Motors of Arizona. This Genuine Cheetah has been certified by BTM Bill Thomas Motors of Arizona with a Certificate of Authenticity.